Banjar Dukuh, Tabanan, Bali, Indonesia. 6 people (1 master suite with king-size bed and 2 ensuite bedrooms with king-size beds). 3 extra beds may be set up on request at additional charge. Living pavilion; dining pavilion; outdoor dining for 8; poolside balé. Main pool: 14m x 7m x 1.5m; Plunge pool: 6m x 4m x 1.5m. Villa staff team includes a part-time manager, cook, butler, housekeeping and security. Additional staff (eg babysitters, masseuses, driver, yoga instructor) available on request on extra cost. Complimentary WiFi broadband internet access throughout; telephone for local and international calls (charged to guest). 4 satellite TVs; DVD Player; iPod dock; Stereo system with CD player. Barbecue; safety deposit box; in-villa spa and beauty treatments; full back-up diesel powered generator. 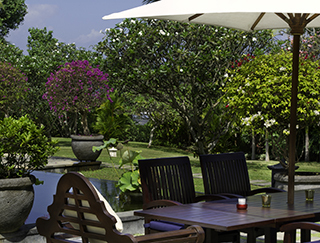 Weddings and events for up to 150 people can be arranged at the villa with prior notice.